Composting is a great way to deal with certain disposables and generate some incredible nutrient-rich food for your garden. In the spirit of “Reduce, Reuse, Recycle” here are Grangetto’s top ten quick tips for composting. Grass clippings and green yard waste are perfect for compost piles. However, you have to add brown material, like dead leaves, too. This gives your pile necessary carbon and prevents it from compacting and stinking. Never put meats or pet droppings in your compost pile. Use yard waste and food scraps only. Keep material treated with herbicides and pesticides out of your compost. This keeps them out of your food. Weeds are a great add for the compost pile as long as the pile is steaming hot. Otherwise, the seeds will survive and grow into new weeds. 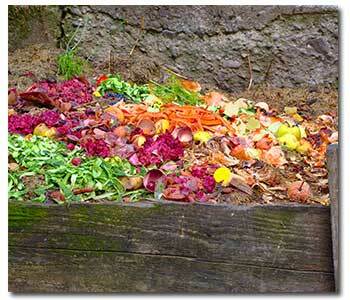 Every time you turn your pile, the composting process is accelerated. Turn it often. Each new layer needs to be moist. A moist compost pile “cooks” quickly; a dry one slows down. It’s important to keep your compost moist – not wet – especially during the summer. If you’re generating a lot of compostable material, make more than one pile. By doing this, you have a better chance of getting to use your compost this season. Mix compost into your garden a few weeks before planting. This gives all those great nutrients a chance to work into the soil. Don’t freak out over bugs and worms in your compost. Most of them actually help the process and are good to have around. Composting works best between 120 & 150 degrees. For best results, do it in the summer, especially for your first time.